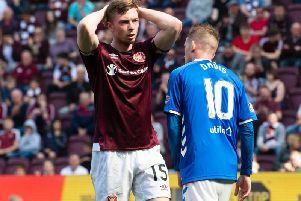 Hearts boss Craig Levein wasn’t slow to poke fun at city rivals Hibs after the Jambos enjoyed the larger attendance of the two William Hill Scottish Cup fifth round ties held in Edinburgh over the weekend. Levein saw his side run out 4-0 winners over Auchinleck Talbot in a repeat of the fifth-round meeting between the two sides in February 2012, with 14,946 in attendance at Tynecastle including around 1,800 fans of the junior outfit. Across the city, a total of 9,131 were at Easter Road for Hibs’ 3-1 win over League One side Raith Rovers on Saturday, with the Starks Park side also bringing around 1,800 fans to the match. Speaking to HeartsTV after the match, Levein was asked about the “quite remarkable” turnout for a “fifth-round match against junior opposition”. The Hearts boss replied: “Yeah, it’s more than nine thousand, isn’t it, 15,000? So that’s good. “I was thrilled to bits with the crowd today and their support of the team. I thought they were very good today. “we want to make Tynecastle a really difficult place to come for anybody, whether it be league or cup ties. Hibs are currently slightly ahead of their Edinburgh rivals in terms of average attendance for the current campaign - 17,457 compared to Hearts’ 17,377 - although the Tynecastle side can boast a greater total number of spectators with 225,899 fans to Hibs’ 209,478.